We’re looking forward to hosting you at the Center for Serve-Learn-Sustain. We are located on the Georgia Tech campus in the Clough Undergraduate Learning Commons (CULC). Our office is on the 2nd floor, Suite 205 (to the right of the elevators and diagonally adjacent to the Starbucks). 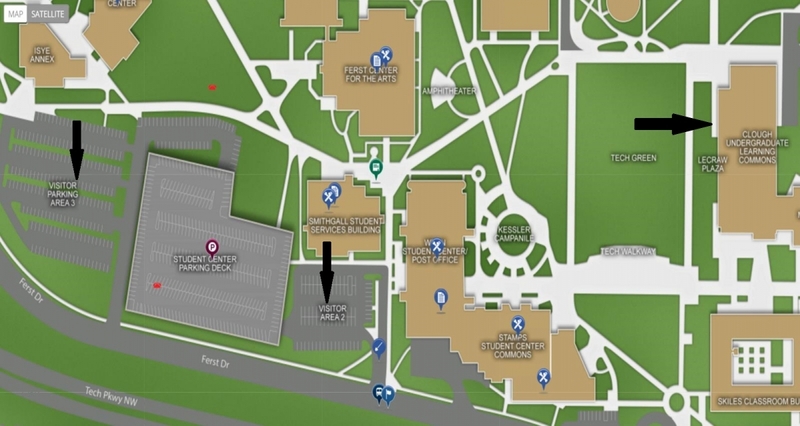 For mapping a driving route to the nearest parking option, you may enter the address for the Student Center Commons (350 Ferst Drive, Atlanta, GA 30332). A map with the closest parking options and the route to our office can be found by scrolling down below. 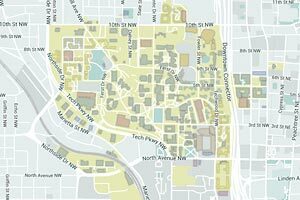 A full campus map can be found here. For assistance with any travel or directions, please contact Jamie Jones at (404) 385-8135 (office), Kris Chatfield at (404) 432-1999 (cell), or Jennifer Hirsch at (224) 392-5608 (cell). We encourage you to take public transportation. The MARTA train is particularly convenient. The Georgia Tech main campus can be accessed via the MARTA train stations at the Midtown/10th Street location and the North Avenue location. MARTA bus service also serves the Georgia Tech campus through bus route 12 (leaving from the Midtown Station), and bus routes 26 and 1 (leaving from the North Avenue Station). In addition, the Tech Trolley provides service between the Midtown Station and the Georgia Tech campus, with a stop in front of the Student Center (an easy walk to CULC). Complete information on the Tech Trolley can be found here. Full MARTA travel instructions to the Georgia Tech campus can be found here. Take Exit 249D (North Avenue). At the top of the exit ramp, turn right onto North Avenue. Cross Techwood Drive (the first light) and continue on North Avenue approximately two blocks to Cherry Street. Turn right onto Cherry Street and then turn left onto Ferst Drive. The Student Center will be located on the right side, with metered hourly visitor parking located in front of the Student Center, or additional hourly parking available on the back side of the parking deck. Take Exit 249D (North Avenue, Spring Street, West Peachtree Street). At the top of the exit ramp, proceed through the first intersection (Spring Street). At the next intersection (West Peachtree), turn left. Continue on West Peachtree for approximately one block and turn left on North Avenue. Cross over the interstate and Techwood Drive. Turn right onto Cherry Street and then left onto Ferst Drive. The Student Center will be located on the right side, with metered hourly visitor parking located in front of the Student Center, or additional hourly parking available on the back side of the parking deck. Visitor parking is available directly in front of the Student Center in Visitor Parking Area 2. Please park in any numbered spot. Payment should be made through the automated machines located in front of the Student Center entrance. Additional hourly parking is available in Visitor Parking Area 3, on the back side west of the parking deck. This lot is actually a bit cheaper but the walk is a bit further. If CSLS will be giving you a parking voucher, make sure to park in this lot. Walk through or around the parking deck to the Student Center. This is a two-minute walk. You will enter the Student Center on the 2nd floor. Take the stairs/elevator to the 1st floor and follow the blue footprints out the rear door of the Student Center. Walk down the walkway until you arrive at the Clough Undergraduate Learning Commons (called CULC or Clough), which will be the first building on the left. You will enter through the main doors on the 2nd floor and our office is located to the right of the elevators, adjacent to Starbucks. When traveling by cab or via Uber, visitors can be dropped off or picked up in front of the Clough Undergraduate Learning Commons, on the ground floor in the parking turn-around. The physical address for this turn-around entrance is 266 4th Street, NW, Atlanta, GA 30313. Enter the building through the main doors and walk up the large staircase to the 2nd floor. Our offices will be to your left, past the elevators, adjacent to Starbucks, Suite 205. If you are arriving in Atlanta via the airport, there are multiple options available to you for reaching our office. The MARTA train serves the airport and is an easy ride to the Georgia Tech campus. The airport MARTA station can be accessed through the baggage claim area and you may exit the train at either the Midtown/10th Street station or the North Avenue Station. Please reference the Public Transportation information above for additional instructions. Taxi cabs are also available at the airport outside the baggage claim area. Drivers should be instructed to take you to the Clough Undergraduate Learning Commons, using the street address of 266 4th Street, Atlanta, GA 30313. You will then follow the directions in the parking section to reach our office. As a final option, you may rent a car and drive to our offices. Please reference Driving North on I75/I85 into Atlanta above for directions. If you are arriving in Atlanta via the airport, there are multiple options available to you for reaching the hotel. The hotel is located at 800 Spring Street, NW, Atlanta, GA 30308. Information on the hotel can be found here. The MARTA train serves the airport and is an easy ride to the hotel. The airport MARTA station can be accessed through the baggage claim area and you may exit the train at the North Avenue Station (Fox Theater exit). Walk through the shopping area and exit to 3rd Street. Turn left on 3rd and then right on West Peachtree. Walk two blocks up to 5th Street and you will see the hotel at the corner of 5th and Spring Streets. Taxi cabs are also available at the airport outside the baggage claim area. As a final option, you may rent a car and drive to the hotel.